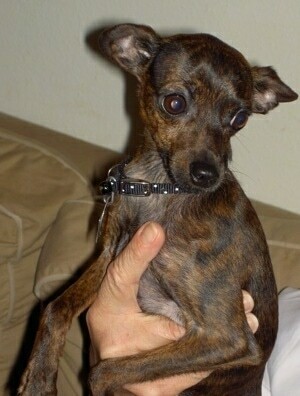 "Meet Moshe, a one-year-old neutered male Italian Greyhuahua. 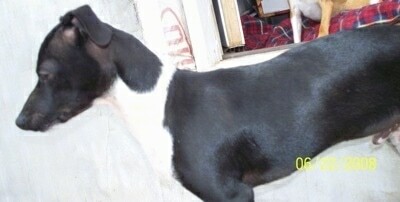 He weighs 6 pounds, stands 12" at the withers, has a beautiful solid brindle coat, and can run as fast as lightning. Although someone docked his tail before I rescued him, he carries it down and flat against his body. Occasionally he will wag it, but always in slow motion. Moshe has the best of both breeds: sweet, gentle, friendly, observant, cautious, playful and affectionate. The sleek, muscular body coupled with the large ears and rounded forehead make for a face that resembles the fruit bat." The Italian Greyhuahua is not a purebred dog. 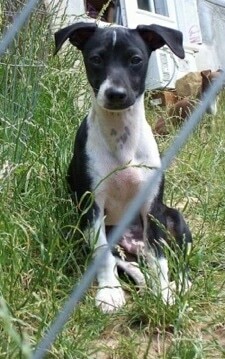 It is a cross between the Italian Greyhound and the Chihuahua. The best way to determine the temperament of a mixed breed is to look up all breeds in the cross and know you can get any combination of any of the characteristics found in either breed. Not all of these designer hybrid dogs being bred are 50% purebred to 50% purebred. It is very common for breeders to breed multi-generation crosses. 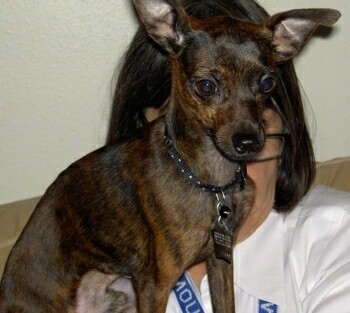 "Moshe, a 1-year-old neutered male Italian Greyhuahua hybrid." 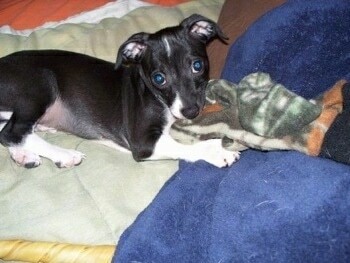 "Cody the Chihuahua / Italian Greyhound (Chi Hound) at 5 months old. Chi Hound is the official CPR registration title for this hybrid." "This is Cody. This picture was taken at 5 months old. 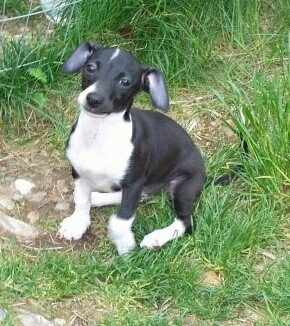 His mother is a Chihuahua and his father is an Italian Greyhound (both purebred). 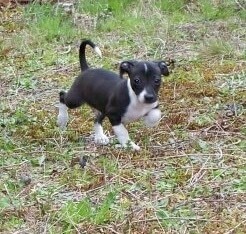 He looks like a Greyhound, but he is smaller with big bones and muscles like an ox. He is extremely fast, strong, playful, and has endless curiosity. He thrives on attention and loves tug-of-war and playing fetch. Like the Greyhound, he has a glossy satin coat and never barks. As a very active dog he is constantly thinking of ways to get into everything and steals everything from the Chihuahuas. He is also loving, attentive, sensitive, and listens when you tell him something." 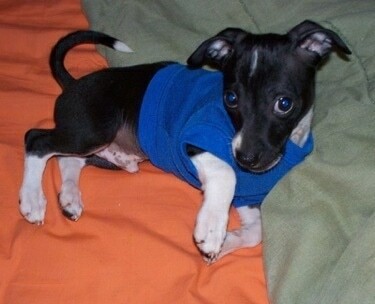 "Cody the Italian Greyhuahua puppy at 4 months old." "Cody as a 3-month-old puppy out of control." This is what we call an escape artist! 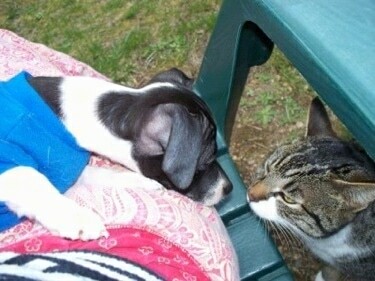 "Cody the Italian Greyhuahua puppy at 3 months old checking out the cat." "Cody the Italian Greyhuahua puppy at 3 months old." 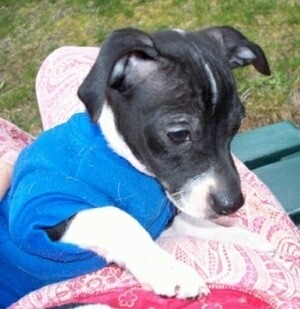 "This is Cody when he was 2 months old. He had those big Greyhound rabbit feet on a little Chihuahua body."